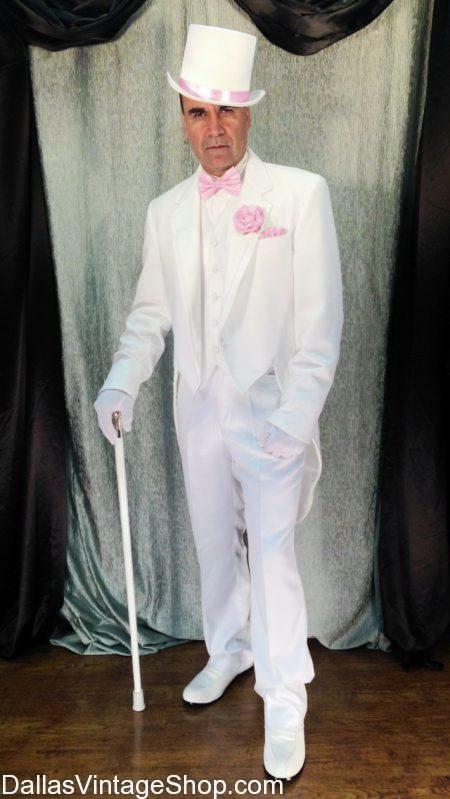 This Valentine’s Day Formal Men’s White Tuxedo with Tails, White Top Hat & Pink Accents & Accessories is only one splendid Valentine’s Apparel Choice we offer. Dallas Vintage Shop has Many White, Red or Pink Tuxes, Tail Coats, Suits, Vests, Shoes, Canes, Ties & Bow Ties, Top Hats, Pocket Squares and Men’s Lapel Corsages. Yes, in all the Valentine’s Day Favorite Colors and we can even help you customize to match your date with Red, White or Pink Hat bands. We have more Valentine’s Formal Attire and Formal Accessories than anyone.